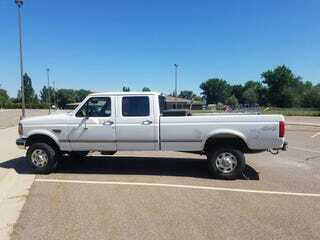 For sale $11000 obo 1996 Ford F350 auto 7.3l Powerstroke diesel 4x4 crew cab long box truck. This truck is one of the cleaner obs’s in the area. The paint is extremely nice and the body is straight. This would be a perfect truck to restore and just keep for a Sunday cruiser! It has 217k miles on it and has plenty more to go! A.c. and heat work great, all power windows switches ect work. This truck hasn’t been abused! I am the second owner and I bought it off an older gentlemen who meticulously took great care of it. All stock except for a ts6 6 position tuner that I just recently installed, and the LED pod lights up front. The bfg ko2 tires on it are fairly new along with a new fuel bowl, starter and new batteries done in April. Interior is in great condition also, it has 1 small crack in the dash and also a small tear in the seat, the seat covers will be included. All guages, both tanks, speakers ect work correctly. The truck does not come with a tailgate but I have a cargo net I will include, nor does the crossover come with truck. You won’t be disappointed in this truck! I’m selling it because I don’t need such a big truck for the work I do. Clean title in hand. If your interested text works best [number redacted] yes that’s the right number. If you see this ad it’s still available.